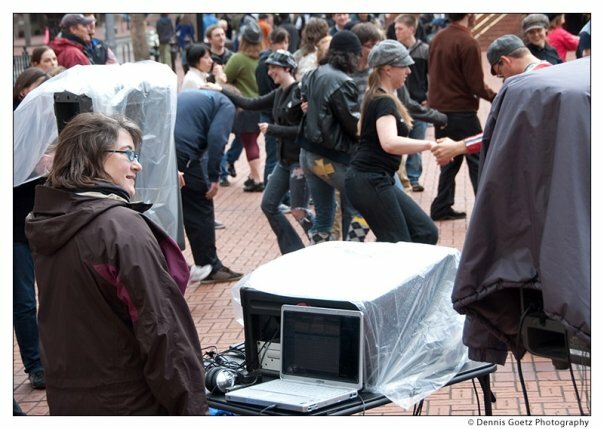 Since 2001, Kristin has regularly DJed for lindy hop and blues dance events in Eugene, Portland, Seattle, and Los Angeles, including regular appearances at Tuesday Blues, the North Star Ballroom, and the Viscount Ballroom in Portland, LindyGroove and Do Something Blue in LA, and Burn Blue and Sonny Newman's in Seattle. Special events she's DJed include the Portland Lindy Exchange (2002, 2004, 2006, 2008, 2009, 2017 and 2018), Rose City Blues (2016 and 2017), & All That Jazz (2016 and 2018), the San Francisco Lindy Exchange (2003, 2009, 2010, 2012, 2013, and 2014), Sacramento Lindy Exchange 2010, Denver Lindy Exchange (2005, 2008, 2009 and 2010), San Diego Fusion Exchange 2010, Austin Lindy Exchange 2009, San Luis Obispo Exchange 2009, MezzJelly Blues 2007, WCLX 6 (Chicago) 2004, Seattle Lindy Exchange 2003, San Diego Lindy Prom 2003, and Vancouver Mini-Exchange 2002. Many of her playlists are online here.